Following advanced tooth loss, a traditional, removable denture can be used to replace teeth and ensure your smile confidence. Unfortunately, without the support of tooth roots, your implant denture will need to rely on suction between the gum and denture for support. This can place a great deal of pressure on you gums and supportive bone tissues. Over time, your gum line will change, and you will need to have your denture refitted or a new denture placed. Implant dentures are fully self-supporting just like natural teeth, and they ensure you maintain the maximum amount of healthy gum and bone tissue. This means your implant denture is natural looking, feeling, and functioning, offering long lasting results you’ll always feel confident sharing. If you want to learn more about implant dentures, call to schedule a tooth replacement consultation with the skilled Chester County Dental Arts team. When you visit our Coatesville dental office, we’ll review your treatment options and help you to plan to fully repair your smile. 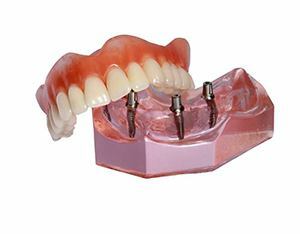 Implant dentures are crafted much like traditional dentures. A gum-colored base material is molded to fit against the gum line, supporting a full row of replacement teeth. Rather than relying on the suction created by the snug fit between the denture and gum line to provide support for the denture, four to six dental implant posts are positioned below the gum line, recreating the healthy, natural root structures of teeth. Traditional dentures are only able to replace about 20% of chewing ability, limiting your diet. Implant dentures restore 70% or more of your chewing range, allowing you to consume all of your favorite foods. A traditional tooth replacement prosthetic needs to be replaced every five to ten years to ensure function, but implant-retained dentures have a 90% success rate after 20 years. Because the roots of teeth are replaced, an implant retained denture is fully self-supporting. This removes pressure that traditional dentures place on bones and gum tissue. 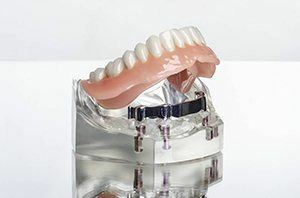 By preserving these supportive structures, implant dentures also prevent the sunken in facial appearance so often associated with denture wearers. Dental implant denture treatment is completed over the course of several months. First, we’ll provide preparatory services like tooth extractions or tissue grafts. Then, your implants are placed. Over the course of several months, the implant posts fuse with the supportive structures. Once the implants have bonded with the bone and gum tissue, you’ll return, so we can attach abutments posts that anchor your restoration to the implants. When the abutments are in place, we’ll design your denture. After we receive the final denture from our lab, you’ll return to the office, so we can affix your custom tooth replacement prosthetic. 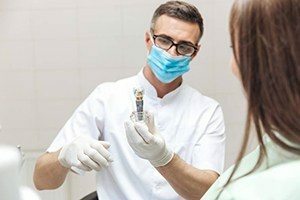 What Happens after Implant Denture Placement? 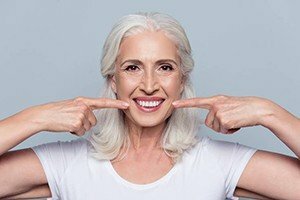 After your implant supported denture is in place, you can look forward to a flawlessly functioning smile that lasts for two decades or longer. You can brush your denture just like you would healthy teeth. You should brush at least two times each day, but for best results, we recommend brushing after meals as well. To prevent the buildup of plaque between the gums and denture, you may want to use an air or water flosser. We can provide an antimicrobial oral rinse to reduce the amount of plaque producing oral bacteria and ensure a healthier smile.